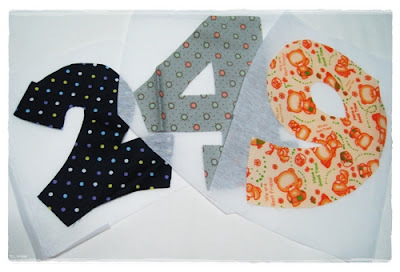 what madeleine loves: Shirt Applique: How I do it? 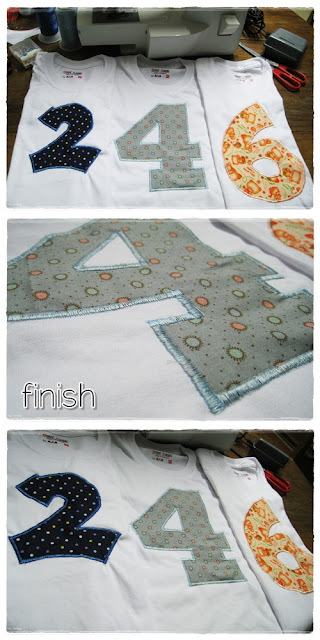 I have been sewing appliqued shirts for kids to give as gifts because I always wanted to give something with a personal touch. I have read lots of tutorials in the net, but my resources are limited (e.g. haven't found Heat and Bond or Freezer paper in any stores I have visited in Cebu -- these are used to bond the applique to the shirt, so it's easy for you to sew), so I did it the traditional way (no bonding). 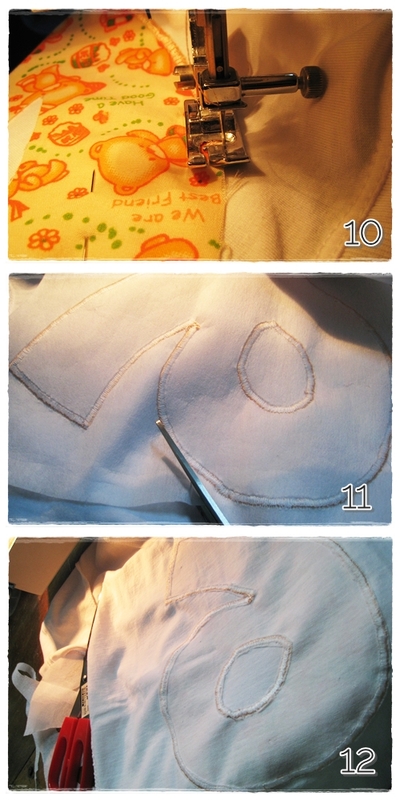 I just have to be careful during the stitching process, stop and adjust once in a while. So here's my first ever tutorial (and hopefully not the last, hehehe!) --- Shirt Applique : How I do it? 01. 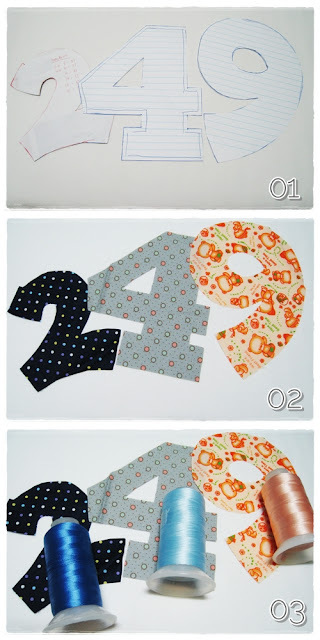 Prepare the pattern for your applique using any sheet of paper or board. 02. Trace the applique at the wrong side of your fabric. Pattern should also be facing on the wrong side. 03. Prepare the coordinating embroidery threads. Prepare the interfacing -- the thicker the better. 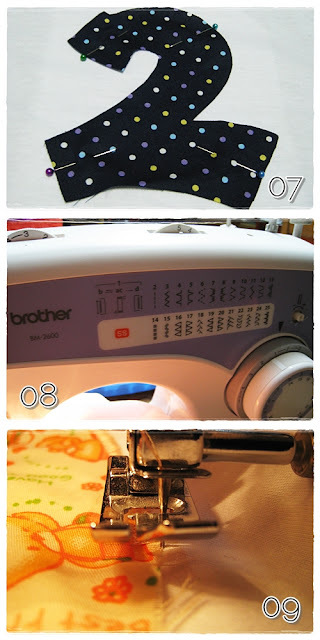 This will prevent your shirt from moving and stretching during the sewing process. Size it according to the applique. 04. Under the shirt, put a card board or anything that is stiff. 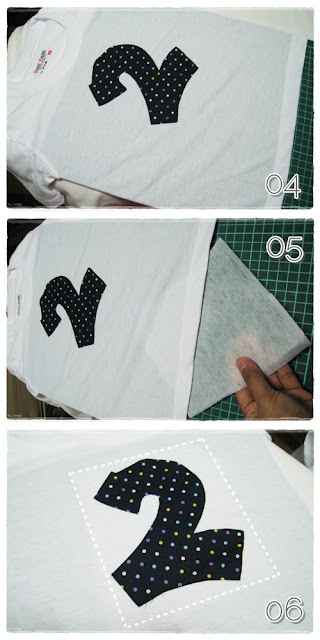 This will help in aligning the applique to the shirt. 05. & 06. Put the interfacing under the shirt, making sure the applique and the interfacing is aligned. 09. Position the needle on the outer edge of the applique, put down the presser foot and sew. 10. Sew. Stop, raise the presser foot and adjust the shirt, when changing directions or sewing in a curve path. 11. After sewing, turn inside out and cut out the interfacing at the back of the shirt. 12. This is how it looks like when done with the cutting. Wow, I wish I have the patience for sewing Mads. Well, to each his own, right? Are you in Cebu? Because I have an idea for my photography hobby but I need a sewing talent for it. Am thinking if you can help me wit it. hi madz! thanks for these. i will show you the photo of the kids soon.